Are smartphones killing digital cameras? 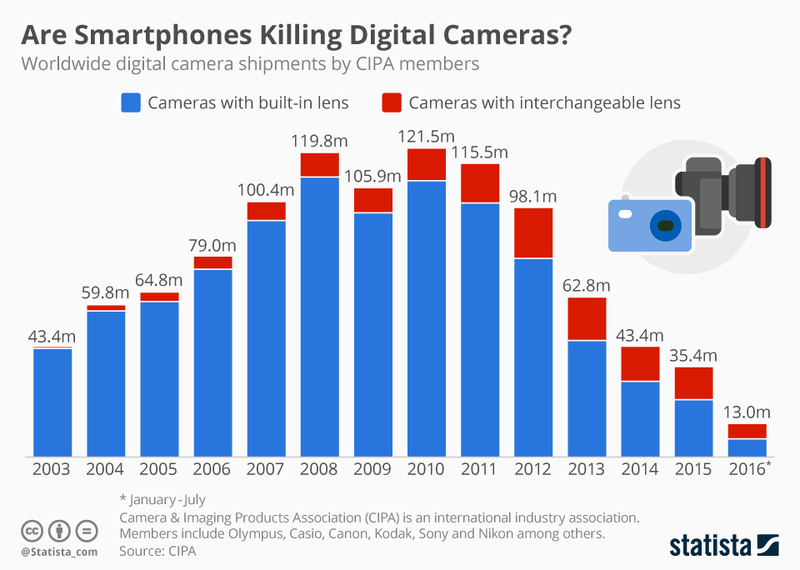 As a quick perusal of prior posts on this blog will show (you can read them at this link), I've long been concerned with the speed of digital networks in general and how fast Korea's networks are in comparison with other countries around the world. Given the multiple organizations that measure internet speed and the many different methods they use, placing Korea in context compared with other countries can sometimes be very confusing. 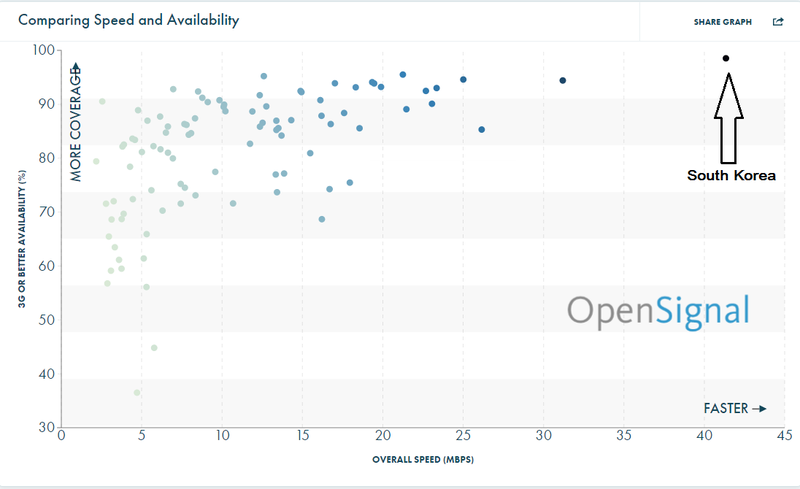 The purpose of this post is not to solve that problem, but rather to call attention to OpenSignal, a relatively new (founded in 2010) company that specializes in mapping wireless coverage and speeds. One strength of their measure is that it comes from users of their app all around the world and therefore reflects internet download speeds in actual usage situations. Open Signal as shown in the world map above and the bar chart at the left, measures "overall speed," which is a combined measure of speed versus availability of 3G and LTE mobile services. (click on the graphics to see a full size version. 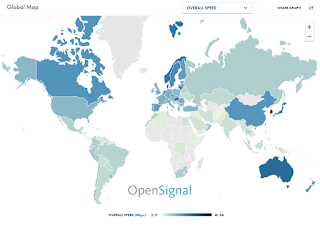 Open Signal defines ".. overall speed as the average mobile data connection a user experiences based on both the speeds and availability of a country’s 3G and 4G networks. Overall speed measurements vary considerably from country to country depending on their particular stage of 3G and 4G development. For instance a country with fast LTE speeds but low 4G availability might have a much lower overall speed than a country with moderate LTE speeds but a very high level of 4G availability." Obviously, South Korea's world leadership in LTE introduction and current penetration (availability) boosts its standing on this measure, relative to Singapore and a few other countries that have fast speeds, but lag behind Korea in availability. 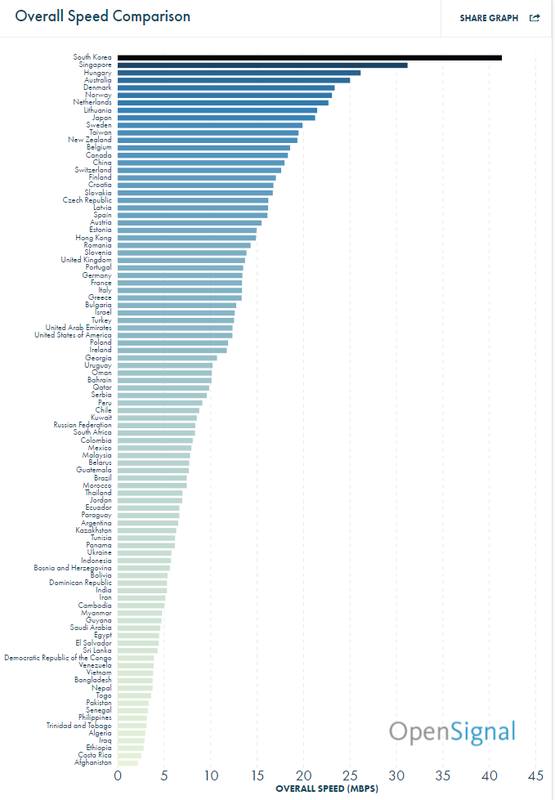 Another was of effectively visualizing this is to see where Korea fits in the chart showing speed versus availability. Click on the final graphic to see a full-size version of the screen capture. 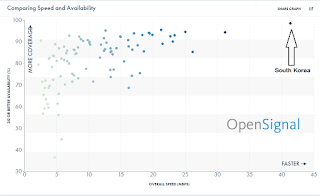 Better yet, go to the online Open Signal report and see data for each of the countries in the chart by hovering over the dots.